What kind of faucet will work best for you depends on your specific needs. You may wish to have different kitchen faucets for various uses, or you may want to add particular accessories to your faucet. Some faucets have only one handle, either fixed to the spout or standing apart from it. With these faucets you can quickly and easily control the flow of water and its temperature with one hand. This is especially useful when your hands are full or dirty. Other kitchen faucets have two handles: one for cold water and the other for hot. The existence of two handles and two flows of water enables you to adjust the water temperature more precisely. More designs are available for two-handled faucets, as well. If the handles have the shape of a lever or cross, you will be able to grasp and turn them more easily; levers are especially suitable for people with various physical disabilities. The spouts of the kitchen faucets may be long, curved, straight, short, etc. Look for a faucet where the spout directs the water to the center of the basin of your sink. If you will be washing large pots or pans, choose a faucet with a big spout that you can turn aside, with a high arch; for example, one about 14 inches (36 cm) long. Then it will be easy to put your large kitchen utensils in the sink and remove them after washing. Again choose a faucet with a big spout if your sink is big or you have several basins. Then the spout will cover as much of the sink as possible. There is also one special spout – also known as a pot filler. You install it on the wall near the range to fill large pots with water when you cook. This saves you from having to carry these heavy utensils from the sink to the range. For this spout you will usually need a separate water pipe, supplying cold water. Rubber washers wear out comparatively quickly, predisposing your faucet to leak. Ceramic disks or cartridges are far stronger and long-lasting. Faucets with such parts are more expensive, but they require little maintenance. Chrome and brass are materials of sufficiently good quality and are among the most frequently used materials for kitchen faucets. These are also faucets that require little maintenance. Other materials may be used for the finishes on faucets, over a base of brass. For example, nickel, stainless steel, copper, zinc, bronze, silver, gold, etc. These materials can have a polished or matte finish, and may be used in combination with porcelain, glass or wood. Keep in mind that there are some faucets you can buy in separate parts. Thus, you will be able to combine different materials, colors and shapes, to create your own design. The manufacturers usually supply detailed instructions on how to install the faucet. Another option is to use the services of a professional. Some accessories are sold together with your faucet, but you will need to buy others separately. Some of them are installed at the side of your faucet, while others are attached to its spout. For accessories that you will install at the side of your faucet you will need a separate hole in the sink or countertop (which you need depends on the type of installation of the faucet). 1. Spray: a body with a hose through which water runs. This helps you with washing big utensils, rinsing vegetables, cleaning up your sink… You have to be able to reach all areas of your sink with it. You install the side spray separately from your faucet; on the left or on the right, depending on what will be more comfortably for you. A pull-out spray (from the spout) will be your best option if you think you will use it frequently and you wish to change the water jet quickly from normal to spray and vice versa. 2. Water filter: for cleaning water; drinking water, for example. The filter will eliminate filth, rust, scale, chemicals, lead, etc. Water filters can be either fixed to the spout of the faucet or separately. 3. Soap dispenser: a container for supplying hand soap. You install it separately from your faucet and eliminate the need for a bottle with liquid soap on the countertop, thus creating a tidier appearance. 4. Hot water dispenser: a spout, supplying hot water. You can use it to prepare different drinks, for example, tea and coffee. You usually install it separately from your faucet. 5. Hole cover: you put it in holes of the sink or the countertop that you don’t use anymore. For example, if you don’t want a soap dispenser anymore, you can cover the hole left from it with the hole cover. Such covers are useful in that they improve the aesthetic appearance of your countertop and sink, and leave open the option of installing more accessories later. 6. Escutcheon plate: this functions like the hole cover, but you can cover several holes with it, not just one. You will add beauty to your faucet with it. It is desirable to make its color match the color of the faucet. 7. Scald protection: by this function you can set the maximum water temperature, to avoid burning from extremely hot water. It is especially useful if you have small children at home. 1. It’s good if the design of your faucet complements that of your sink (or of the kitchen furnishings, for example, the metal wares in the room). 3. The prices of faucets vary according to the quality. Buy the best faucet you can afford. This is an appliance you will use constantly, so you need quality materials and construction. 4. If you want your faucet to be accessible to people with disabilities, look for one that conforms to the requirements of Americans with Disabilities Act (ADA). 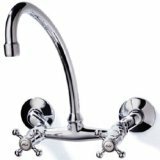 Click here for the best deals on kitchen faucets. Nice list. Buying kitchen faucets can be tricky but you have some good suggestions. You have shared some wonderful suggestions to purchase kitchen faucets and explained the features in detail way. Which is better faucet? Delta, Grohe, Moen? Each of these companies makes excellent products, and they back them up with a high level of service for us. Great job putting this entire article together. Lots of good information. Thank you for taking the time to do it. Something that doesn’t get enough mention is noise. A quiet faucet is something people don’t think about looking for, but you will certainly appreciate it once it’s in your kitchen and the noise level of a standard faucet prevents you from hearing the radio or having a conversation on the phone. Yes, this is really important. I have similar problem in my home at the moment. Thank you for this addition, Joe. Faucets make the kitchen. Spend the extra pennies, and get something unique and substantial that will last you for many trouble free and stylish years. Don’t forget to get the right basins to go with your faucets either. Do not make the mistake of going too small on your basins, you will regret it! Been reading your excellent blog for quite a few weeks now, and I am enjoying many of your excellent topics. When installing a hot water system, it is important to take into account your family’s needs. Size does matter when it comes to hot water. Not only should you consider the amount of bathrooms, but also dishwashers and washing machines. Seriously consider your family’s lifestyle. Great videos. Thanks for posting. It really makes it easier to learn hands on stuff like this visually. I had a new kitchen faucet installed this week by True Plumbing in Fort Worth, Tx. They did a great job, and I FINALLY have one of those soap dispensers. Actually, I have the hand soap and dish soap dispensers which are completely awesome! It only took a few minutes for the plumber to install it, and it’s made my kitchen look so much nicer. If anyone needs a plumber in Fort Worth give them a call at 817-542-1980. I came to know different types of kitchen faucets. I would never known about this if haven’t stumbled upon this blog. Thank you very much. Water saving kitchen swivel sprayers with rotary heads and metal joints. These sprayers help to save water and won’t lose their powerful spray and amount of water flow. Look at http://www.aguaflux.com or http://www.wateruseitwisely.com. Replace your kitchen sprayer and make sure to make use of water in an appropriate way of manner. I have installed these sprayers in my kitchen and bath, they are doing a great job and they still work. Great!!! Great article and videos about faucets. Thank you so much. In August of 2004 we purchased a “Fontaine” kitchen faucet from planetfaucet.com with a ten year warranty. During the short time we had it, we had to change one of the cartridges twice due to leaks. After only six years, the spout was pitted very badly. The spout then broke where the pitting had occurred. I decided to use the “Ten Year Warranty”. After a month of back and forth emails, the president of the company said he would not warranty the faucet because the manufacturer in China said it should not be pitting. BEWARE of Fontaine Faucets, their warranty is just for looks. Thank you, Ganka. I hope you continue write helpful kitchen articles like this. This is a very nice post on kitchen faucets! I will bookmark it as I have a plumbing business. Thanks. Installing a faucet – so easy a homeowner can do it! No need to call the plumber! Great info, thanks! Danze faucets is what I ordered. Hope they are good quality. I hope so. Danze offers many modern kitchen faucet styles as well. It is great to let people know about ADA products at the end of your post. Many people are not aware of the great benefits ADA products allow and that they have everything from sinks to faucets. It is really a great and excellent post. It shares almost everything about kitchen faucets. I’ve been reading this blog for a month and upon reading every article I always learned something new. Keep up the good work. Congrats! Wonderful kitchen faucet review and kitchen plumbing article. I found your comments insightful and useful to readers. Thanks for the fantastic read. The single handle kitchen faucet is what we have at home. It’s very easy to use and stays on budget. From most of the blogs I’ve ever seen, this blog is the blog that I’m looking for. It has complete information for kitchen faucets. It includes the types of faucet handle, and spout. It also includes here the materials that you’re going to need in case you want to install a faucet in your kitchen. It is really helpful for the readers who are looking for complete information about kitchen faucet. This one is such a nice blog post. It offers us a lot of information regarding the plumbing types. Hi Ganka, I finally decided to write a comment on your kitchen blog. I just want to say that I really enjoy reading your posts. Thank you for your comment, Jim. Shopping for kitchen faucets online will save you money. The selection you will find on Internet is much broader as well. Your kitchen faucet and sink are among the most used and hardest working items in the kitchen. Whether you’ve decided to remodel to update the style of your kitchen, or because of physical damage we would like to help. I like the comment you made on designing of a faucet to complement that of your sink. Many times people just completely disregard the plumbing aspect and only concentrate on the aesthetics. Nothing wrong with that, but if the parts don’t fit and there is a leak, then what is the whole point of installing new and beautiful faucet. Thank you for the helpful review. I have learnt a lot from this review and have put my pick on the single handle kitchen faucet. Thanks a lot! I also want to add that the reviews could be made more helpful by including reviews of some kitchen faucets. As someone who sells kitchen and bathroom fixtures — Danze faucets especially — for a living, I’m glad you put an article like this together. The more consumers are informed, the better.